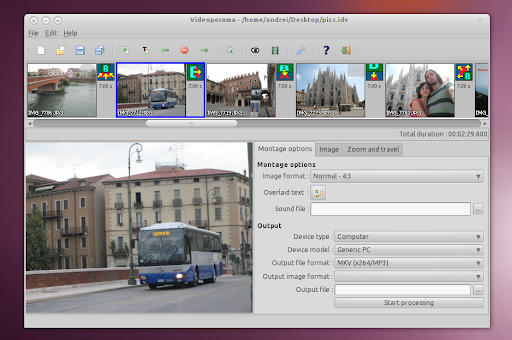 In a comment on our Make A Movie Out Of Photos In Ubuntu Using PhotoFilmStrip, someone suggested a similar application called Videoporama so I though I'd review it. 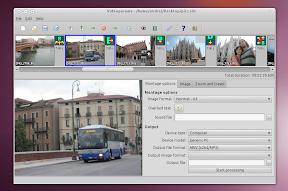 Videoporama (available for Windows and Linux) is an application you can use to create videos (or slideshows - call it what you like) from images. It comes with a lot of nice transition effects which you can manually set or use them randomly for all the photos in your project. You can also apply text to each image (in 3 modes: overlay, background and fixed) which can then be tweaked in many ways such as color, transparency and so on. And of course, you can add a sound file to your new video too. Besides cool transition effects, Videoporama also comes with lots of presets for the resulting video: for mobile devices (include iPod/iPhone), computer or the web - which you can save in mp4, avi, webm (latest version only!) or flash. Just like with PhotoFilmStrip, you can save your video in FULL HD. Another cool feature is that Videoporama uses MPlayer to let you preview your slideshow before processing it. Overall, I've found Videoporama a bit more complicated to use but it also has lots of effect you won't find in PhotoFilmStrip. You can find some more professional-looking videos @ Videoporama website. Once install, you can find Videoporama under Applications > Sound & Video. Only Ubuntu 10.10 Maverick Meerkat comes with the latest Videoporama version (which comes with WebM and MP4 support, among other features) but if you want to install this version in Ubuntu 10.04, you can download it from Guiodic's PPA (as always, many thanks to Guiodic!). Note: I haven't tested the version in this PPA so use it at your own risk! If you're using Windows, download Videoporama from HERE.